While Teagan’s life may have changed from the obscurity of a reclamation worker on Earth to that of royalty in the Parvac Empire, she soon discovers her notoriety places her in danger. After a cunning plot orchestrated by Consul Dano, Teagan is manipulated into a political marriage in order to maintain peace. However, the marriage is to the son of Laconia’s other ruler, Consul Bosh, and Commander Quaid Bosh of the Hadrian infuriates Teagan. Attempting to regain control of her life and avoid Commander Bosh becomes more challenging when the consuls extend an invitation to Princess Probus to visit the Laconian Sector. During the diplomatic tour, the lives of Teagan and her loved ones are placed in jeopardy when she is abducted by a small army of hybrid mercenaries with nefarious plans of their own. 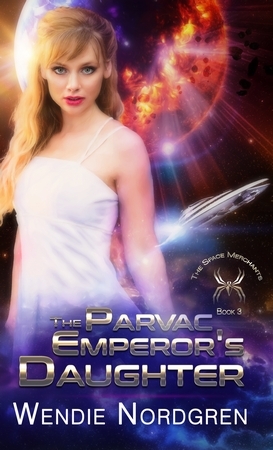 As the hybrid mercenaries chase Teagan through the galaxies, the Parvac Empire and Galaxic Militia will have to work together to save her from the criminal mastermind controlling the hybrids.